Lynn Stahl at her home in Watchung on March 5, 2018. When Lynn Stahl decided to replace her home’s roof, she wanted something that would last. She hired Wagner Roofing of Flemington to do the job in 2010 for $9,020, and all seemed fine at first. But today, less than eight years after the roof was installed, it’s failing. “The shingles lost a lot of the composite material on them so you could see through to the fiberglass,” Stahl said. She said she made the discovery in November 2017. Since then, Stahl says, she’s been given the runaround by both her contractor and TAMKO, the shingle manufacturer. A close up of the TAMKO shingles on Lynn Stahl’s roof. The materials are beginning to degrade. When Stahl first noticed the problem, she called the installer, Wagner Roofing, and a rep came out to look. “He advised me that the shingles are defective and advised me that the roof looked like a 25-year-old roof even though it is just seven-and-a-half years old,” Stahl said. The rep told her to contact TAMKO’s warranty department, which she did on Dec. 15. The company asked Stahl to complete a “claim kit” and to send two roofing shingles to show the damage. 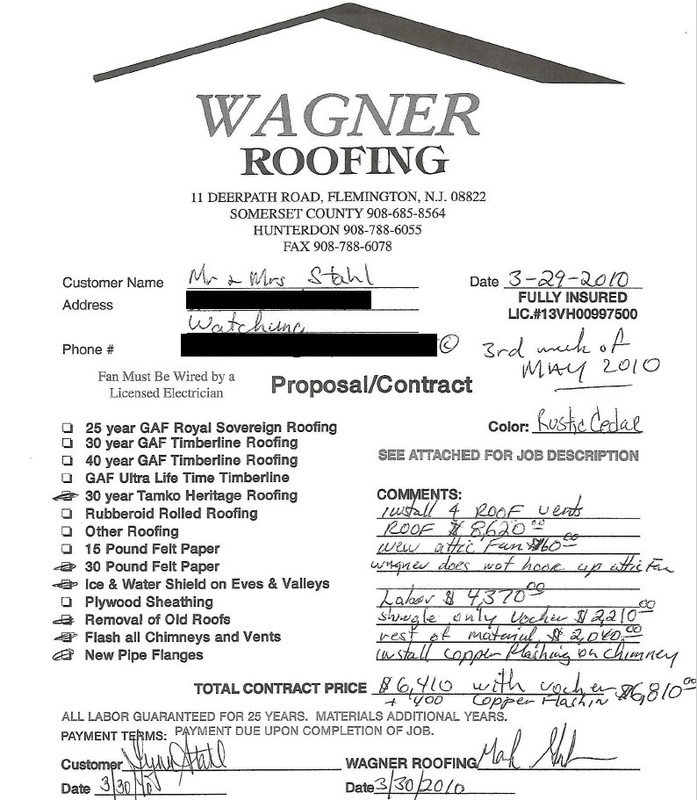 Wagner Roofing came back and removed two shingles, which Stahl sent to TAMKO. She received response on Jan. 23. TAMKO agreed the shingles were defective, and it offered a settlement package: a check for $100 and a certificate for 26 squares of roofing. Stahl’s roof needs 34 squares. TAMKO explained the amount is prorated based on the age of the roof. That wasn’t good enough for Stahl, who asked Wagner Roofing to contact TAMKO on her behalf. The Wagner rep said he’d have to ask the company’s owner, Stahl said. He also advised her to escalate the claim with TAMKO. A TAMKO supervisor called Stahl on Feb. 19, saying her shingle was not a 30-year shingle but only guaranteed for five years. After that, the limited warranty is prorated. “Who would ever agree to putting a five-year shingle on their roof?” Stahl said. She said the supervisor also told her the roofer was wrong to say it was a 30-year shingle. Yet the TAMKO spokesman told us the limited warranty was for 30 years, so the message is anything but clear. Further, Stahl’s contract with Wagner does put an age on the shingle. She called Wagner the next day. “When I asked what they would do to stand behind their contract, [the rep] told me he didn’t know,” she said, and the rep once again said she’d need to speak to the company’s owner. Stahl said she’s tried, but the company’s secretary never puts her call through and messages aren’t returned. “I can’t believe that the owner of a reputable company is not willing to speak to an unhappy customer,” she said. Wagner Roofing has no complaints with Consumer Affairs and it has an A+ rating with the Better Business Bureau. TAMKO also has an A+ rating with BBB, but it’s not without dissatisfied customers. There have been attempts at class action suits in Florida, California, Illinois, Missouri,Colorado, Connecticut and Kentucky, claiming manufacturing flaws and bogus warranties. In all, 16 suits — not all attempted class actions — were filed since 2009, according to a public records search. Eight were dismissed, three were settled, one had a judgment against TAMKO and another had a judgment in TAMKO’s favor. Three more are ongoing. We reached out to both companies. TAMKO was quick to answer. Part of Lynn Stahl’s roof. She said the shingles are degrading. He also said there are no time frames attached to the shingles, and he pointed to TAMKO’s prorated limited warranty, which does not state a time frame. “The Prorated remedy offered to the Ms. Stahl by our Warranty Services Department is in accordance with the terms of the limited warranty and reflects the years of use she actually received,” he said. Then Stahl received another call from the company. This time, the manager offered her certificates for all the shingles she’d need to redo the roof, plus a labor certificate for $8,500, which could be redeemed by whichever roofer she hires. “I told her I do not want to put TAMKO shingles on my roof again so I would like a check instead of the shingle certificate,” Stahl said she told the manager. Stahl also said she wanted to get estimates from a few roofers before agreeing to a dollar figure for the labor. We went back to Cook, the spokesman, hoping the company would do better for Stahl. We asked about a television report in Dallas that said TAMKO paid a homeowner $14,500 to replace her damaged shingles, and we also asked about the class action suits. Cook didn’t address the television report, but he said class actions are common in his industry. He said the courts have so far refused to certify any of the suits as class actions. “We strive to promptly resolve all warranty claims within the terms of our limited warranty so we believe there is no merit in any case that has not yet been resolved,” Cook said. Of the promises for a 30-year roof made by Wagner Roofing, Cook said TAMKO wasn’t part of the conversation. Then Stahl got another call from TAMKO, offering a check for $2,720 instead of a certificate for replacement shingles, and a labor certificate worth $9,350. That would be a total of $12,270 for the new roof. But Stahl’s three roofing estimates came in for $15,075, $16,150 and $17,039. She asked TAMKO if it would increase the labor amount so Stahl could come out whole. TAMKO said yes, offering $12,355 for the labor certificate. That brings the total refund to $15,075 — the same amount as Stahl’s lowest estimate. Stahl said she’s satisfied, but still disappointed with how both companies handled her complaint. “It was only when Bamboozled stepped in that I got any cooperation from TAMKO to resolve this issue,” she said. After this column ran on NJ.com, Wagner Roofing reached out with a statement. The company said it never received any of Bamboozled’s messages. It said it did help Stahl on several occasions, coming to her home every time she asked. The company said it contacted TAMKO on her behalf, too. Mike Wagner, the company’s president, said the company told her to continue to contact TAMKO to get more money for labor. On the company contract, Wagner said it offers a 25-year labor warranty. “Our labor didn’t fail, the material did,” Wagner said, adding that if the company was going to install a new roof, Stahl would still need to pay for the labor. This entry was posted on March 18, 2018. Bookmark the permalink.